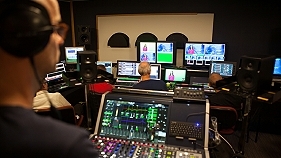 IP live production: debate from VRT's LiveIP studio. provide new services to viewers. More importantly, these opportunities will increase broadcasters’ flexibility to continue innovating so they can remain at the top in our increasingly competitive business landscape. On 01 March 2016, you are invited to attend a unique webcast directly from the VRT LiveIP studio. The 45 minute multi-camera debate, produced entirely using IP technology will feature Mick De Valck, CTO of VRT, Charlie Cope, BBC Sport and Morten Brandstrup from TV2 Denmark, who will share their user perspectives of the transition to live IP production in front of an audience comprising of industry experts and commentators. After the debate, the floor will be open for the audience to ask your questions. For more details and to register for the debate, click here.